He shifted the focus to increasing the strength of our awareness, noting that a single object such as the breath or sound can act as a support. “When we recognize that we have the motivation to meditate, it doesn’t matter what the mind is resting on,” he clarified, and then moved on to awareness. Awareness is like the sky. Clouds might gather in the sky as well as wind and lightening and hail, but it does not affect the sky at all. The sky might be clear blue and have rainbows, but that doesn’t make the sky any better. It all occurs within the expanse of the sky. Likewise, awareness is just knowing and if a good thought happens, that’s fine. If a good feeling happens, that’s fine. If an unpleasant feeling happens, that’s fine; and, if a neutral feeling happens that’s fine. If you feel tight, that’s fine. If you feel loose, that’s fine. It is all like clouds in the sky. Even if those clouds stay in the sky for a long time, it does not affect the sky. In order to cultivate awareness, you rest within whatever thoughts, afflictions, or appearances arise and they become part of your meditation. When you are able to rest within – whether gentle experiences of bliss or clarity or rough experiences of pain or dullness – it becomes an aid for awareness. Building upon Goshir Gyaltsap Rinpoche’s teachings, Mingyur Rinpoche turned to a verse from The Aspiration of the Māhamudrā of Definitive Meaning which teaches all the points of shamatha. May we know how to rest naturally and freely, not altering. Lastly, we do not need to fabricate or change anything. We have so many afflictions, but because we are not aware, we fall under their control. Mingyur Rinpoche said, “It’s like a rushing, raging river, if you fall into it, the water will carry you away. When you can see the river, you are not in it. Likewise, with our thoughts and afflictions, if we view them and do not fall under their control, they do not harm us.” Whatever afflictions – greed, hatred, delusion – arise in our mind, we aim to look and see them without falling under their control. The main point is that we are able to direct our attention and cultivate this awareness. 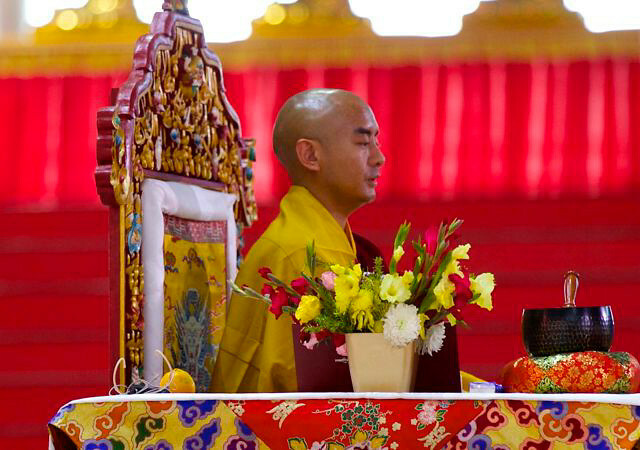 Mingyur Rinpoche next introduced a technique focused on pain. He smilingly asked, “Do you have any unpleasant feelings?” Hands went up throughout the pavilion. For those few who did not have any unpleasant feelings, he instructed to squeeze the soft flesh on the hand between the thumb and forefinger. “Direct your attention towards any feeling of pain in your body and if you don’t feel anything, squeeze your finger on that spot and direct your attention towards it.” He concluded the meditation explaining that unpleasant feelings can also be aids to meditation. The last guided practice entailed paying attention to whatever appears in the mind. “Please close your eyes,” he said. “Now, as you close them, whatever feeling happens for you, direct your attention towards it.” Whether a feeling of dullness, a foggy torpor or vivid clearness, just rest in it. “Just look at the sensation,” he encouraged. “We need to recognize awareness and develop confidence in the awareness of our meditation,” he concluded.